May I Have the Definition Please? 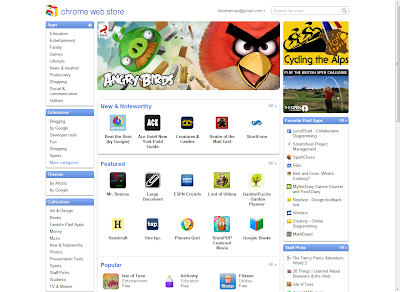 If you use Google's Chrome browser, you may or may not know about the Chrome Web Store. You can access it from the new tab page, and in it you will find a wide variety of apps and extensions for Google Chrome. Many times you will also see a microphone icon that will pronounce the word for you when clicked. Extremely handy. The Dictionary Extension by Google is the first extension I install when using Chrome on a new computer and I highly recommend trying it out. 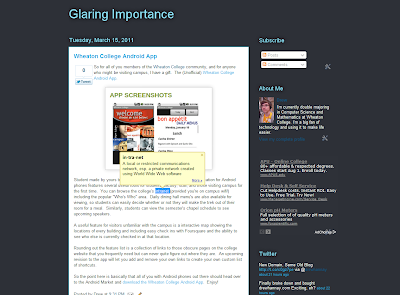 As you may have noticed, you're now viewing this blog at drewhannay.com rather than drewhannay.blogspot.com. This is thanks to me finally being willing to put down $10 for my own domain name. I figured considering how often I tell people of the importance of owning their online identity, I should probably follow my own advice. The whole domain buying process was actually incredibly simple. After a quick Google search, I ended up at the Google Apps Sign Up page. You get the option to either set up an existing domain you own with Google Apps or buy a new domain name. After finding out that my domain name was available (Not many other Drew Hannay's out there, thankfully), I just typed in my Google Checkout password and I was off and running. About five minutes of clicking through wizards and I had my own custom Gmail, Google Calendar, Google Sites, and Google Docs set up with a @drewhannay.com address. I did run into a bit of trouble setting Blogger to point to my new custom domain (which was the original goal after all...), but a quick search for the error message got things sorted out. Turns out the problem was that by default, Google Sites redirects all your traffic to itself, rather than letting it go to Blogger. One setting change later, everything was working. I highly recommend snatching up the domain name for your name if it's still available. Even if you're never planning on using it, owning the name will prevent anyone else from buying it and using it for stuff you don't necessarily want to show up when a potential employer googles you.